Disney’s Old Key West Resort (a Disney Vacation Club (“DVC”) Resort) is a wonderful place for returning visitors to Walt Disney World to stay. It’s the most spacious, most livable, and least expensive of the DVC resorts, and is my personal favorite among them. For typical first-time visitors, I don’t recommend the Disney Vacation Club resorts. That said, these “DVC” resorts can be a great choice for first time visitors with large families, needing extra sleeping spaces, or looking for a more comfortable place to stay. 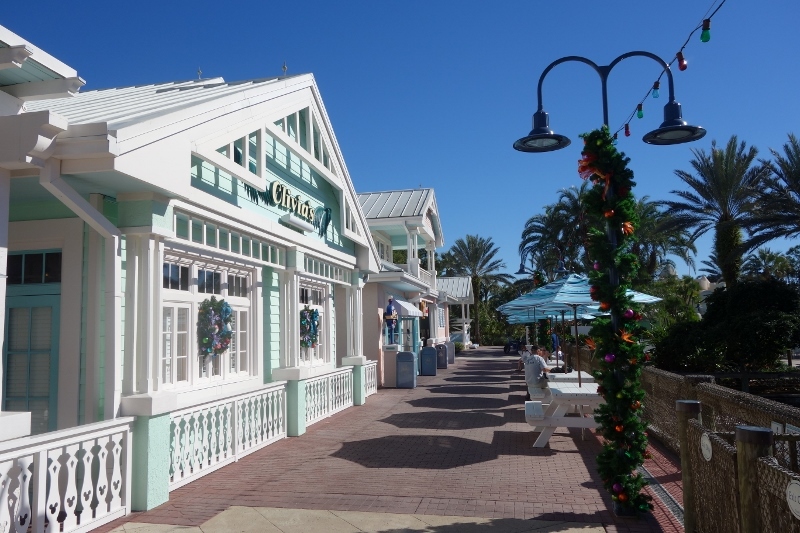 Among the Disney Vacation Club Resorts, Disney’s Old Key West Resort ranks eighth overall for first time visitors, with its particular strengths being livability and value for money. You can have a spectacular visit at any Walt Disney World resort. However, this site recommends that first time visitors to Walt Disney World avoid the Disney Vacation Club resorts, while noting that these resorts are wonderful for visits after the first. The recommendation comes from the simple fact that the distinguishing feature of these resorts–extra space and full kitchens–will not be of much value to first-time visitors following one of the itineraries on this site, as they won’t be used much. 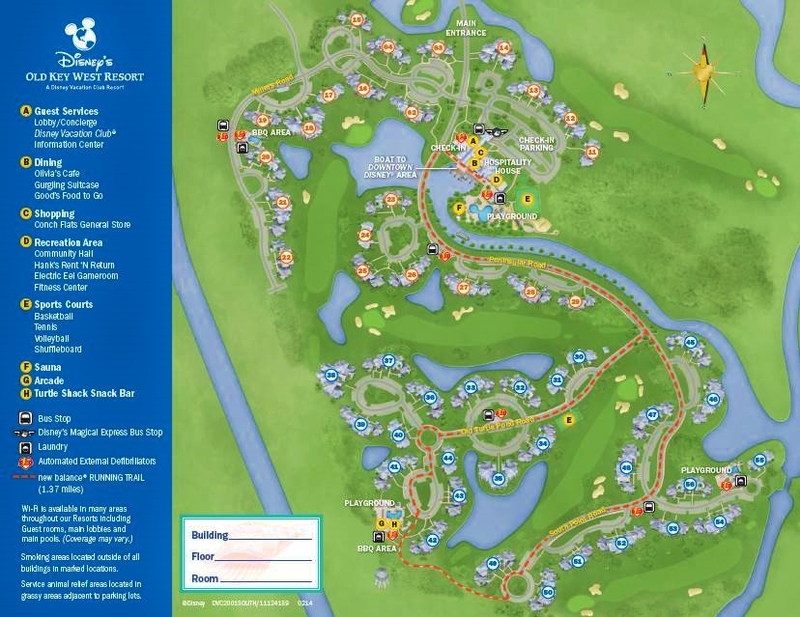 That said, the Disney Vacation Club resorts represent more than 10% of Walt Disney World’s total rooms, and are very appropriate for first time visitors with large families, needing extra sleeping spaces, or looking for a more comfortable place to stay–especially if you have a car, as Old Key West is pretty spread out. Because of this, I always provide of up-to-date reviews of these options. 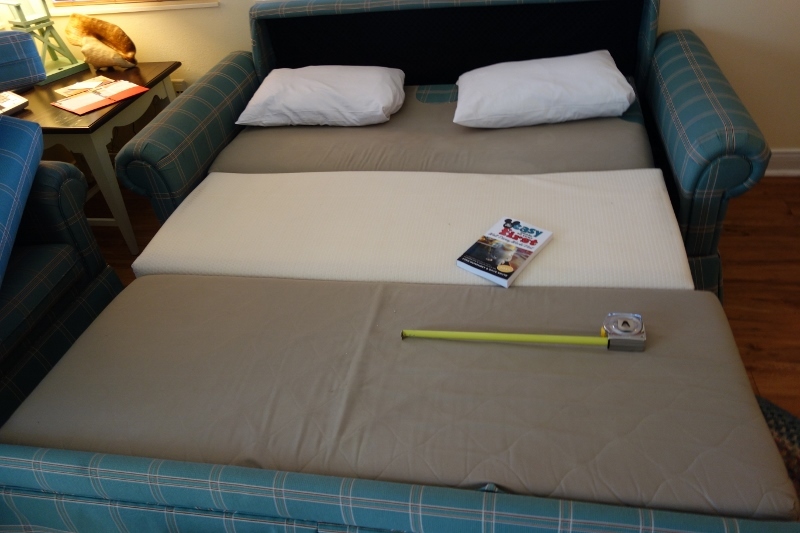 This Old Key West review is based on our fifth stay at Old Key West since this site opened, in December 2014. Old Key West Kid Appeal. While quite charming to adults, Old Key West has no real kid appeal compared to spectacularly-appealing alternatives like the Villas at Disney’s Wilderness Lodge and the Villas at the Animal Kingdom Lodge. Old Key West is not as isolated as it is sometimes described to be–it’s not far from Epcot, for example. 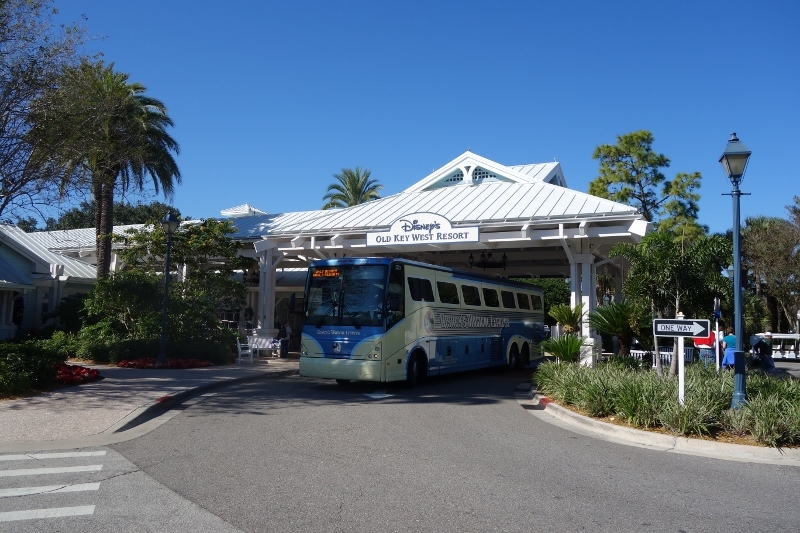 That said, its distance, sprawling layout–with many services far from most rooms–and five bus stops make it among the least convenient of the Walt Disney World resorts. Old Key West has a number of very strong positives. Old Key West Resort presents far and away the best value for money among the Disney Vacation Club resorts. It has the lowest prices of the DVC resorts (other than a few spaces I wouldn’t recommend to anyone), and, in its one and two-bedroom villas, the largest and most livable spaces. 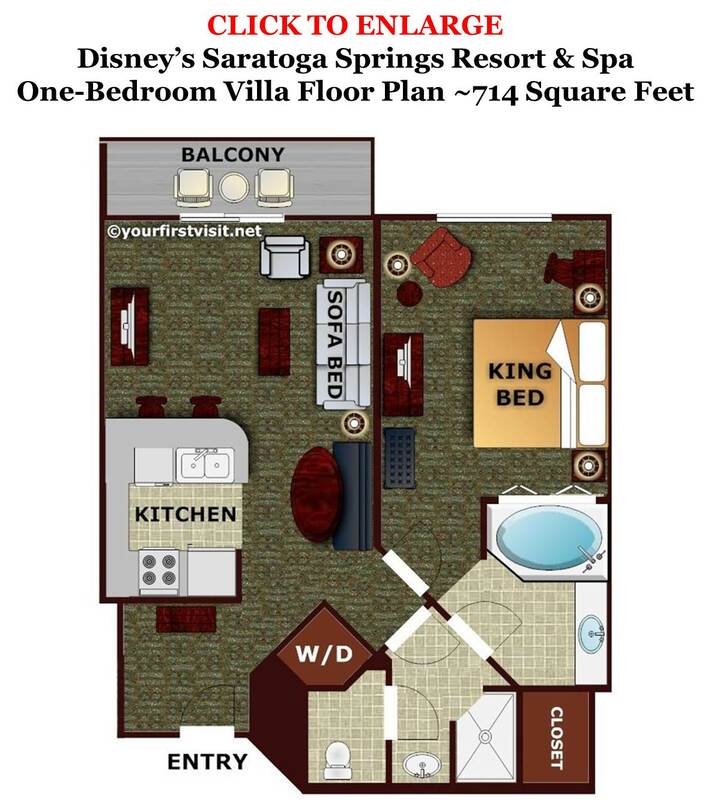 Compare the One-Bedroom Villa floor plan (above) with that of a similar villa at Disney’s Saratoga Springs Resort and Spa (below). 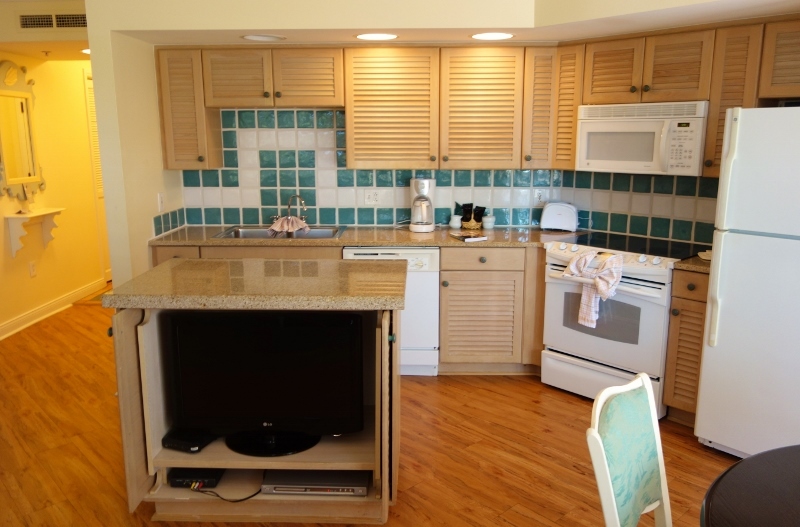 The One and Two-Bedroom Villa living/kitchen/dining area space is much larger at Old Key West than at any other DVC resort, as is the balcony. The practical effect is that One and Two-Bedroom villas are much more livable in general, and in particular when the pullout beds in the living room are unfolded. A second positive of Old Key West–one that it share with Saratoga Springs–is that because of the “single-sided” building layout that both of these resorts have, there are no bad views. Views at Old Key West can be of water, trees, or golf courses–but not parking lots or the backs of buildings. Finally, the sprawling layout with its multiple smaller guest room buildings makes the resort feel much less like a hotel, and more like a small town. The casual architecture supports this look and feel. Old Key West Resort also has some distinctive negatives. Only three of its 49 three-story buildings have elevators–Buildings 62, 63, and 64. For One-Bedroom villas, only buildings numbered 30 and above have an entrance to the (only) bath from both the master bedroom and also from the kitchen/dining/living area. In buildings numbered lower than 30, one has to enter the master bedroom of a One-Bedroom villa to get to the bath. Since one of the key benefits of the One-Bedroom Villas compared to regular rooms is separation and privacy, this is a big deal for many. Buildings 62, 63 and 64 are the best buildings at Old Key West. (See the resort map above; click it to enlarge it.) Request a third floor room (better views, quieter) in one of these buildings. These three are the only buildings at the resort that have each of an elevator, both master bedroom and living room access to the bath in the One-Bedroom villas, and a very short walk to the main pool, shopping, and dining area of the resort. Buildings 62, 63 and 64 are, in fact, the only buildings that have more than one of these three features! Building 62 is my favorite among these. The other buildings that are a short walk to the main pool and such (11-16 and 23-26) have no elevators and no second door to the bath. These buildings are great if you do not care about the door or elevator. Of these, 11-14 are the closest to the main area. Building 12 is my personal favorite. 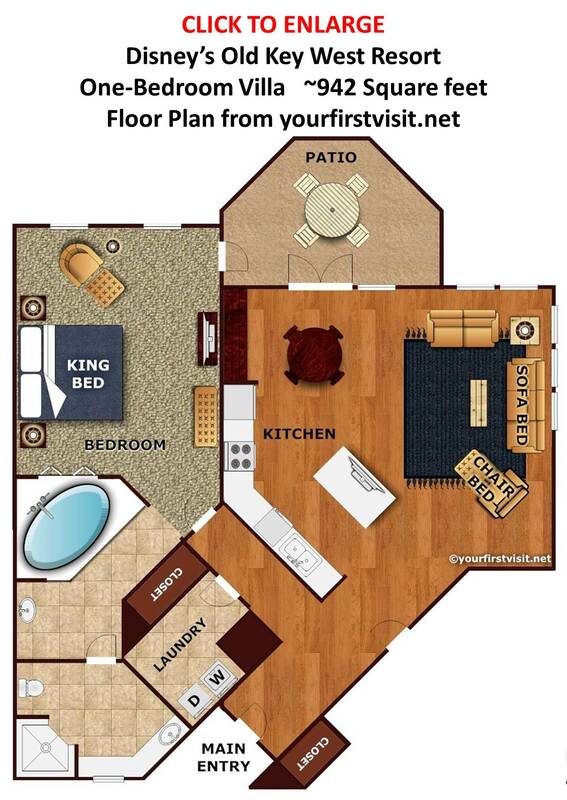 Request a second floor room (same reasons as above). Avoid buildings 19-22, 38, 39, 41, 42, and 49-51, because of the traffic noises they can face. Old Key West has a particularly complicated online request form, and it won’t let you make requests for specific buildings, although it does enable requests for two key features–elevators and dual bathroom entrances. Your best bet is to call. Larger families, families seeking a bit of extra privacy or more beds, families looking for a more comfortable place to stay, families with a car (so they can overcome the inconvenience and sprawl of the resort). It’s one of my personal favorites. Families looking for a distinctively kid-appealing or convenient resort; families without a car. My family of 7 is staying in Old Key West for 7 days in October. We are bringing a 5 year old and a 6 months year old. It will be the 6 months first trip and the rest of us are Disney Vets but have never stayed at this resort. Will this resort be accomidating for us bringing an infant? Will their be activities that our family can partake in while down at the resort? What is your opinion of the restaurant at Old Key West? James, not sure what you mean by “accommodation to an infant” but folks bring hundreds of thousands of infants a year… The restaurant Olivia’s is fine but not special, a review of it is on this page. 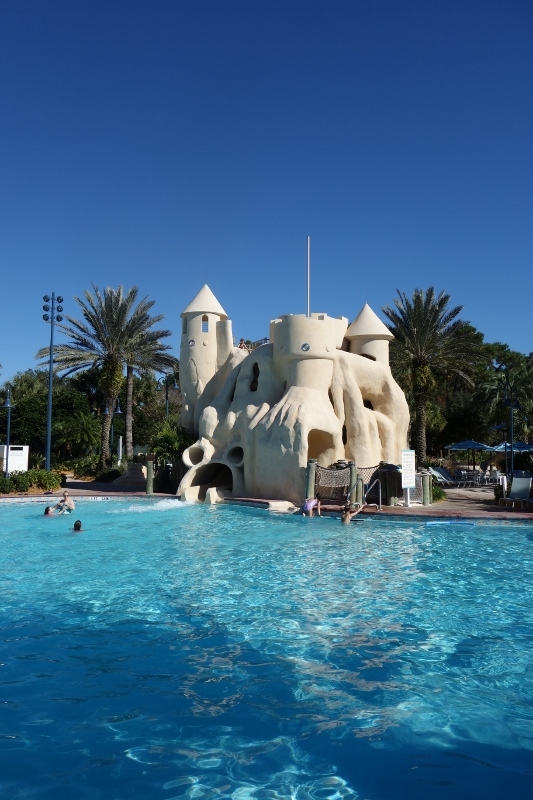 OKW has the same guest activities as most WDW resorts–pool games, movies, etc. When do you feel is the perfect time to call and request a specific building? I see you like 62, which would be what I am aiming for, but I am not sure when they would assign buildings (or maybe how far in advanced do they do that?). It’s August now and I’m not going till next July. Thank you! If I’m using the online request would “canal view” and “near transportation” give me a good chance at building 62 do you think? I’m going in January so I’m hoping it won’t be too crowded. Linda, you park right outside your building! Tasha, what do you mean by “loads”? And will your parents be in the villa, or wandering about the resort? Tasha, if your villa ends up on a higher floor, can they walk stairs, or will you need want an elevator? We just got back from a week at Old Key West and requested a top floor unit close to the Hospitality House. The top floor units will avoid any loud and late night pounding neighbors you may encounter which worked well for us. The building we had was #28 and it was ideal for the bus stop and a close walk to the main pool and hospitality house area. 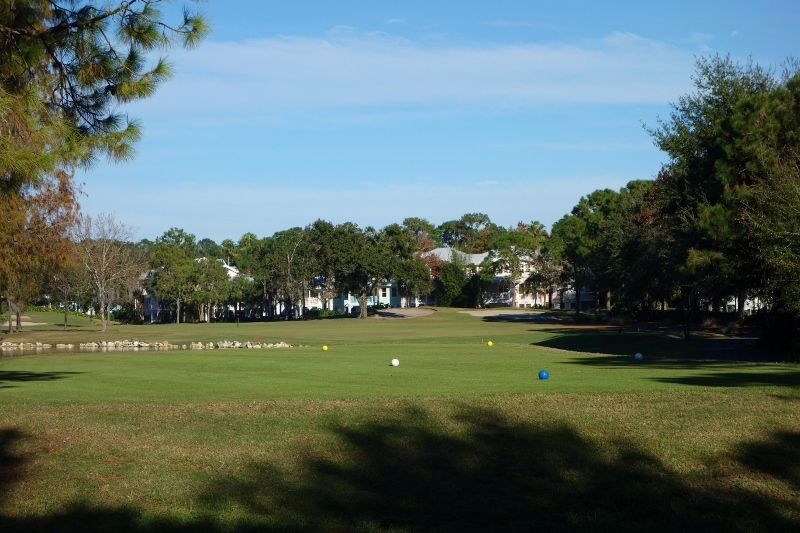 OKW does a great job of situating almost all buildings with a golf course, water or wooded view and you really cannot go wrong. 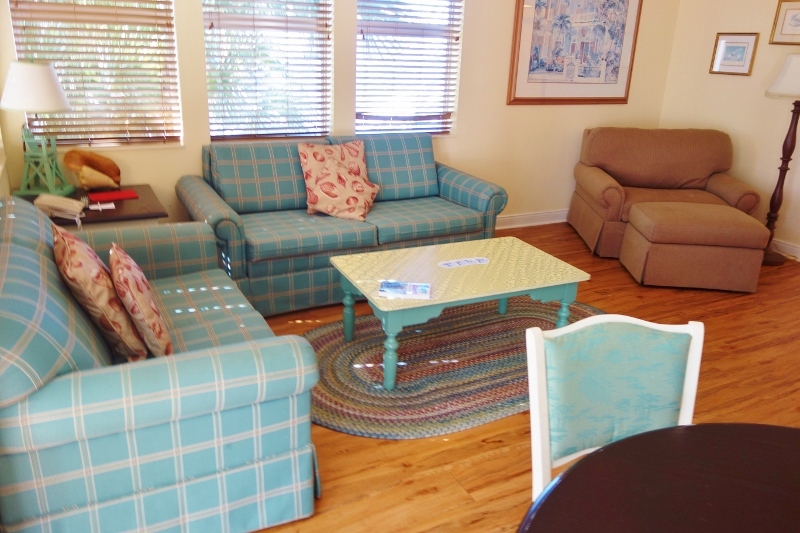 The units are huge and we loved the theme and feel of the resort depite it’s age! Does anyone know which buildings are two-story? IIRC, most are 3 floors but there are some 2 floor buildings. I would be most interested in the Turtle Pond & South Point areas because we need that extra bathroom door. Rachel, I don’t know, and some searching has not told me–great question though. Posting your question here https://www.disboards.com/threads/okw-lovers-thread-part-2.3113113/page-166 might get you an answer!